Jonah Rawitz performing as Usnavi from In the Heights alongside other finalists at the sixth annual National High School Musical Theater Awards at the Minskoff Theatre in New York City on June 30, 2014. Broadway was bustling with future talent on Monday night for the sixth annual National High School Musical Theater Awards at the Minskoff Theatre. After whittling a starting pool of 60,000 teenagers from across the country down to just 56, the finalists took the stage for group and solo performances. 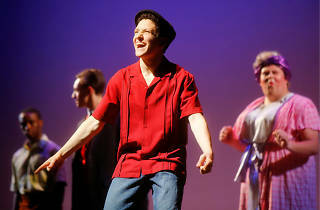 Jonah Rawitz of Buffalo Grove, Illinois, a student at Lincolnshire's Adlai E. Stevenson High School, took the $10K top prize as Best Actor at the "Jimmy Awards" (nicknamed for theater mogul James M. Nederlander) after reprising his starring role from last fall's Stevenson production of In the Heights. The 16-year-old student is definitely no stranger to the stage; he's already worked professionally at the likes of the Goodman, Marriott and Drury Lane. Rawitz spoke with us by phone about his exciting week and what's ahead for his junior year and beyond. Tell us a little bit about your experience in New York. It was just an amazing, amazing trip. I was able to learn so much from both the professionals who were there coaching us, as well as I was able to learn so much from the other kids who were there because there were so many enormously talented kids who came to New York. You have some professional experience here in Chicago; did you find that the other kids had similar backgrounds like you? Or did you feel like you had a leg up on the competition? Well, the way it was, because we were all friends there—none of us really talked that much about what we’d done or anything. I’m sure a lot the other kids had similar experiences. I don’t think I had a leg up on them in that regard. I mean everyone was super talented. You’re going to be a junior [at Stevenson], where you were in In the Heights. And that’s how you got chosen for the competition? 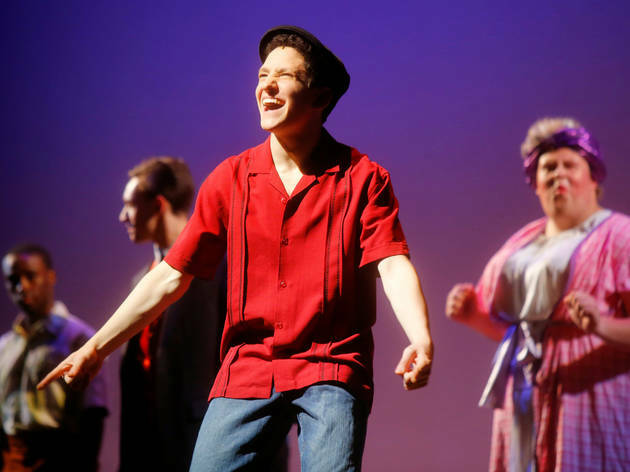 Do you think that role specifically helped you gain recognition for the Jimmy Awards? Yeah, I think so. It was my dream role, basically. So I think I was able to really feel the part and really just express that story. I love telling that story through those words, and I think that people were able to see that I really believed in the story and that I really love the characters in the show. For the competition you also did a solo song, which was “If I Didn’t Believe In You” from The Last Five Years. That’s an amazing song. How did you choose it? Have you ever been in that show? No, I have never been in that play. But I did know the song. And the reason I chose that one is because I think, once again, it’s all about storytelling, and I think that song tells such a beautiful story through its lyrics, through its writing, and through its music. And so I just really wanted the chance to portray that character and be able to tell that story. What would you say has been your favorite role to play so far? Oh, wow… Usnavi [in In The Heights] was just my dream role. What are you working on right now? Do you have college plans, or are you currently in a show? Uh, not too sure about college plans, because I’m not applying yet. But as for this summer, I was supposed to be at camp but I decided not to go because of the Jimmy Awards. Right now I’m working on some original music that I post on my YouTube channel. I’m trying to write a bunch right now, if I’m able to do that. And then of course there’s a musical this year at my high school that I’m hoping to do. Did you do anything differently when you prepared for the Jimmy Awards? Did you kind of approach it like one of your other roles, or was it bigger to you? Well, it’s branded as a contest, but there was such a tight bond with every person who was there that it ended up feeling not like a contest. For most of the time it just felt like we were putting on this show together, and we all wanted the show to be the best it could be, so we all worked as hard as we could. What would you say would be your dream role to play? I still say Usnavi because I love that part so much, but wow, my dream role… There’s so many! I think Moritz from Spring Awakening is a great, great role. And I love the music from that show. But there’s a bunch of roles that I’d love to do. Is there one person you look up to most in the world of theater? Oh my gosh, well, just off the top of my head I look up a lot to the composing side of things. I would say I look up to Lin-Manuel [Miranda, the composer of In the Heights] a lot because he took a totally new form that hasn’t really been present in theater, the idea of rap, and he put it into a show and told an amazing story using it. He revolutionized theater, in a way, as many have before him. I look up to him a lot.